Mendel had his peas, Darwin his finches. Geneticist Kat Arney (perhaps unsurprisingly) chooses cats as her biological muse. But the U.K.-based science writer doesn’t pick just any felines to illustrate science’s emerging understanding of gene regulation—she leans on the six-toed cats popularized by Ernest Hemingway, whose Florida estate still teems with the polydactyl felines. “Learning about Hemingway cats and their broken [genetic] switches got me thinking about my own understanding of how genes work,” Arney writes in the introduction to Herding Hemingway’s Cats. The author explains that it’s not faulty DNA that leads to polydactyl cats or humans, but rather mistakes in the molecular machinery that ushers genes through the processes of expressing their proteins at the right times and places during development. What follows is an engaging journey through the science, both historical and cutting-edge, of the complexities of genetic functioning. Arney wants the reader to understand that we have a lot to learn about how DNA works—moving away from the concept of DNA as a blueprint and closer to that of an orchestral score, where a conductor and several musicians interpret, modulate, and bring the tune to life. Virtually everyone who has hair fusses over it (Bernie Sanders types notwithstanding). But few of us amateur coiffeurs et coiffeuses understand the stuff to the extent that biologist Kurt Stenn does. The former Yale dermatology professor and current hair-follicle biotech CSO explores the history, biology, and cultural significance of tresses in his book Hair: A Human History. 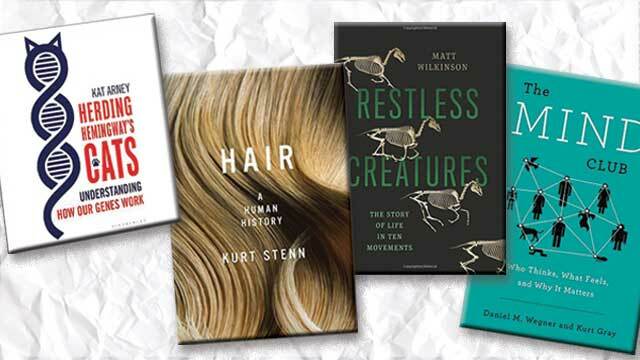 Chapters on the evolution of hairlike structures in long-extinct mammalian ancestors, on the somewhat mysterious cellular biology of hair follicles, and on pathologies of hair set the stage for Stenn’s forays into the cultural impacts and oddities surrounding human pelage. Stenn peppers these later chapters with factoids and a cast of characters that will intrigue readers of all stripes: in 2007, a book dealer bought a single strand of hair plucked from the corpse of South American revolutionary Che Guevara for more than $119,000; a lock of 10,000 hairs has the tensile strength to support the weight of more than one adult person; etc. It’s an alliance we all perceive ourselves to be a part of: the group of beings who can sense, think, feel, and experience the world. Most humans are relatively sure of their membership in this “mind club,” but disagreements over what other entities—animals, computers, spiritual beings, etc.—deserve inclusion are where the conversation gets interesting. The philosophical problem, which has occupied thinkers for centuries, serves as fodder for The Mind Club, a book by two psychologists, Harvard University’s Daniel Wegner (who died in 2013) and Kurt Gray of the University of North Carolina at Chapel Hill.